Jonah Berger discusses his new book on social influence. 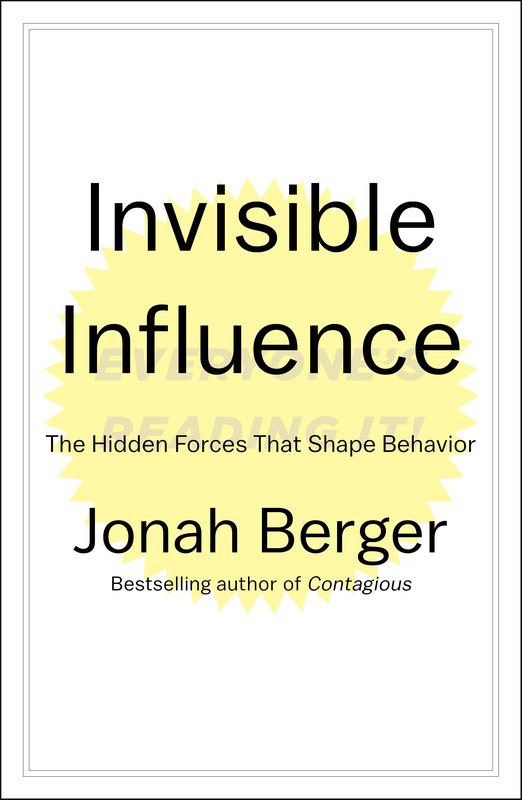 In his new book, Invisible Influence: The Hidden Forces That Shape Behavior, Wharton marketing professor Jonah Berger takes us inside the conscious and unconscious ways that social influences shape our decisions. Knowledge@Wharton recently had an opportunity to talk with Berger about his book. Knowledge@Wharton: What was the inspiration for focusing on social influence as the topic of your book? What’s really funny about that is social influence happens in the world. We see everybody else doing the same thing. “Oh, look at all those DC lawyers. They all drive the same car.” But when it comes to our own behavior, sometimes we feel like our own behavior is somehow privileged, or different. I am a rugged individual. I’m independent. No one else has any effect on what I do.” Actually, we’re kind of wrong. What I thought would be interesting to talk about in this book is all the science about how others shape our behavior, often without us knowing it, and what we can do about it and how we can use it to live happier and healthier lives. Knowledge@Wharton: Your previous book, Contagious, focused on why things go viral. Do you feel like there’s an interplay between social influence and virality? Invisible Influence is almost the converse, or the opposite. It’s, “Well, how are other people affecting my behavior?” Sure, we can use that to influence others. But we can also use it to make ourselves better off. To help us make better decisions or be healthier when we’re having trouble doing that. Knowledge@Wharton: The book is really not about how to go above the influence. You make the point that resistance is a bit futile when it comes to social influences. Whether we know it or not, it’s happening. Berger: That’s, I think, the most interesting part. We see it all the time. If you ask people, “Oh, of course. You know, my neighbor bought this thing because someone else bought it.” Or, “My wife did this thing because someone else was doing it.” But we don’t necessarily see it in ourselves. That idea — resistance is futile — is important. What we have to be careful of, though, is influence isn’t always a bad thing. Imagine if we couldn’t use others as a source of information. If every time we wanted to figure out where to go out to dinner or what movie to watch, we had to sample it ourselves? It would be exhausting. We would have to read all the information and look at all the options and sample a little bit here or there. Others are a really helpful cue. Others often help us make better decisions. But not always. Invisible Influence talks about, when do others help us make better decisions? When do they make worse decisions? When do others motivate us? When do they demotivate us? And how can we use this to be better off? Knowledge@Wharton: If we know that social influence is going to play a role, how can we harness that and use it to help us make better decisions? Berger: One thing I talk a little bit about is motivation. Others often affect whether we give up, whether we try harder. How can we use that to be better off? One thing I felt in my own life — you want to exercise, you want to be healthier. How can you use others to help you do that? Simple tricks like working out with other people, really having someone else to compare yourself to [matter]. There’s lots of research on something called social facilitation. Merely biking with someone else, for example, makes you bike faster. Running with someone else makes you run faster. Swimming with someone else makes you swim faster. Others can help us do things that we might not do otherwise. So we can set up situations where we actually encourage ourselves to be healthier, encourage ourselves to make better choices, by shaping our environment through others. Knowledge@Wharton: What are the factors that go into determining whether social influence will make us want to, for example, buy the same car as our neighbor, versus buy a different one? Or make us want to work harder, versus give up? Berger: I’d have to give you a long answer for all of it. But some simple things are, first, others often provide information. When we’re uncertain about what to do, we often look to others. That leads us, often, to the same thing. Yet at the same time, we want to see ourselves as different. Particularly in American culture, we like to see ourselves as special snowflakes — like my dad, buying the blue BMW rather than the gray one. Maybe we pick the same car, because we know it’s a good car, because others have bought it. But we pick a different color, because colors allow us to feel different. So we’re similar and different at the same time. We’re optimally distinct. Or in terms of motivation, for example. Others can motivate us, except when they are too much better than we are. If we compare ourselves to someone who’s much better, much faster than we are, sometimes it causes us to give up. We say, “Well, there’s no way I’m going to reach that standard, or that score, or that level of performance. They are so much better than I am that I’m not going to try anymore.” It’s really about understanding the subtle differences of social comparisons, and understanding the situations people are in, that helps us figure out which way it goes. Knowledge@Wharton: You have a couple of really interesting examples like this in the book. My favorite one was why social influence makes it harder for us to parallel park but easier to tie our shoes. The reason is, I hate it when people watch me parallel park. I’m horrible at it if someone’s watching. I’m a master if no one is. He had them run one of two mazes. One that was either straight ahead, just really easy, or one where you had to run straight and then make a left turn, really difficult — “Do I go right? Do I go left? What do I do?” What he found is, when the task was easy, when it was well-learned, running straight — something cockroaches know how to do well — having others around helped them do better. They ran faster with others than they did by themselves. But when it was a difficult task, when they had to figure out, “Do I go left or do I go right?” Then it was more complicated. The mere presence of others actually made them do worse. As you mentioned, parallel parking. If we know how to do things well, if they are easy things we’ve already done a bunch, then having others around makes us do them better. If you’re great at shooting pool, for example, shooting pool with someone else will actually make you better at shooting pool than by yourself. But if you’re not so good at shooting pool, if it’s something that you’re not used to doing, if it’s difficult for you, then having others around can make you do worse. Parallel parking, for example, maybe some of us are good at it. But most of us tend to be a little bit nervous to begin with. We’re not excellent parallel parkers. Merely having someone else in the car can make it more difficult for us. It makes us more nervous, more anxious. While that anxiety can help us do better when it’s easy for us to do those tasks, they can lead us to do worse when it’s a difficult or complicated task. Knowledge@Wharton: So to get back a little bit to buying cars, you mentioned in the book that social influence can actually make rich people more likely to buy different cars than their neighbors. But for those of us who are more middle class, it might actually cause us or influence us to buy the same car. What’s interesting is, uniqueness isn’t a right answer or a wrong answer. It’s just a way of behaving based on our social environment. Knowledge@Wharton: As the internet has become part of our daily lives all the time, and social media has become more of our daily lives, it’s easier and easier to know what your friends are doing. It’s easier for companies to know, even, what your friends are doing. How does that play into social influence and the degree to which social influence is playing a role in our decisions? But it also makes it easier for people to switch to something else, or avoid something because too many people are doing it. As I talk about in the book, we don’t just want to be similar. We also want to be different. And so sometimes when too many people like a particular band we say, “Well, I don’t like it anymore. I like their old stuff, before they became mainstream.” And so what it’s really done is, it’s led to faster cycles of fads and fashion. Things catch on more quickly, but they also die out just as quickly. One thing I talk a lot about for companies and organizations is, well, how do we manage this? As a brand, for example, I want to catch the upswing. I want everyone to be buying my product. But how do we avoid the downswing, when people say, “Well, it’s too popular. I don’t want it anymore.” Or, “If those people are doing it, maybe I don’t want it.” How can we capture the good aspects of that, and avoid the bad? Knowledge@Wharton: It seems like it would be so fleeting for companies to catch the upswing. By the time you know there is an upswing, it’s already on the downswing. Berger: Yeah, a little bit. What’s also allowed and possible now is there’s so much rich behavioral data that we can get more of a sense of who’s buying something, what else they’ve bought, and what they’re like. Amazon, for example, has a good sense of what type of books we like and can say, “Well, these type of people used to be buying this. Now, a different type of folks are buying it.” I agree with you. It’s not perfect data. But it’s certainly better than it has been before. Knowledge@Wharton: When you were writing this book, were you surprised to realize how social influence played into your decisions? Berger: Yeah. I am the worst person to shop with or make decisions with. I have a huge problem making decisions. Part of it is because I’m always thinking, “Well, what are other people doing?” I’m saying, “Is the reason I’m doing it because other people are doing it, or do I really like it myself?” What’s interesting is, there’s no answer to that question. Others often affect us without our realizing it. But by being aware of it, sometimes hopefully we can make better decisions than we would have otherwise. Knowledge@Wharton: As you were saying, we have this vision— particularly in American culture – of the rugged individualist. We place a very high value on nonconformists. Nonconformists are the best. They are pathbreakers. They are above the influence. Does a nonconformist really exist? Goths, for example. You look at kids that dress in all black. Well, they’re all actually pretty similar to one another. We like to see ourselves as different. We like to think, “Oh, the unique person, the nonconformist, they win out. They lead companies.” Really, those people conform just as much as everybody else. It’s just that they don’t seem like they’re conforming, because they may not be doing what the mainstream is doing. But they tend to still do what other people like them do.